Wendy here and I can't believe this is the countdown for the last two projects on the Evalicious design team! WOW, time flies when you're having fun, right?! I hope I've inspired you, even if a little bit, while hanging out here with Evalicious. I can definitely say the product is VERY inspiring and makes creating a breeze. Feels good when amazing product works your mojo in that way, ha! 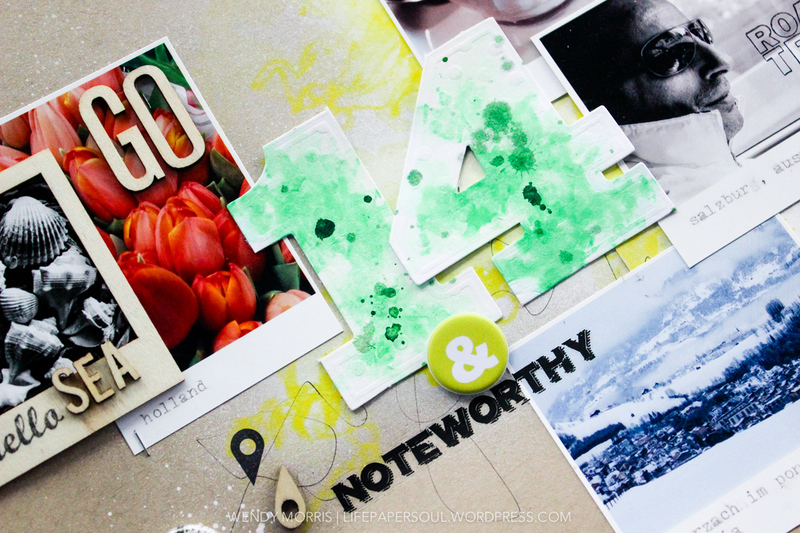 Project Inspiration | I created this project based on 2014 (aka '14) inspiration from travels earlier this year and my love for a touch of mixed media to my projects. 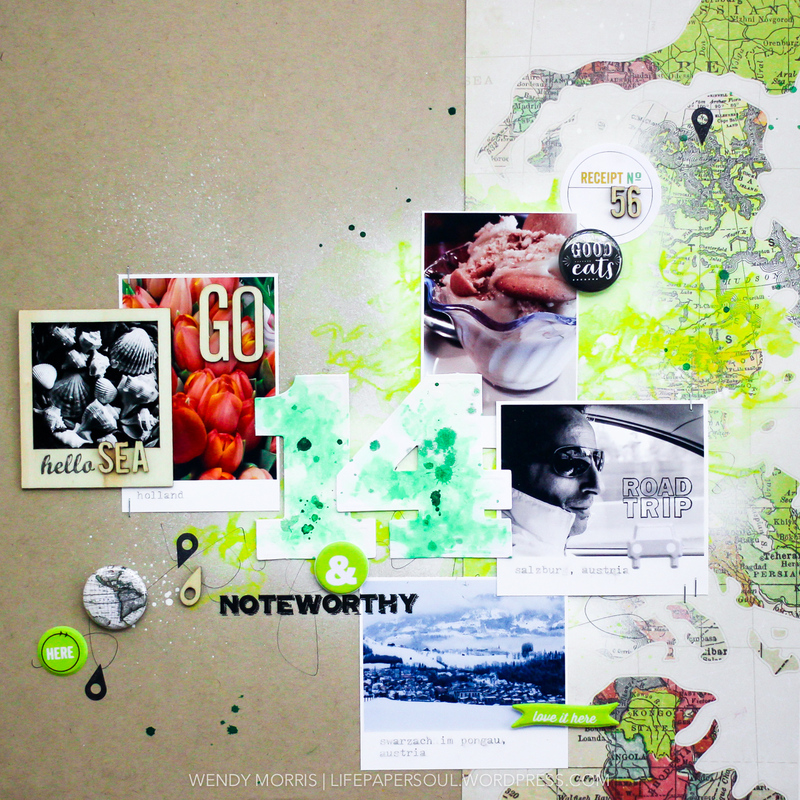 So, I worked both worlds for love of travel + mixed media for you. 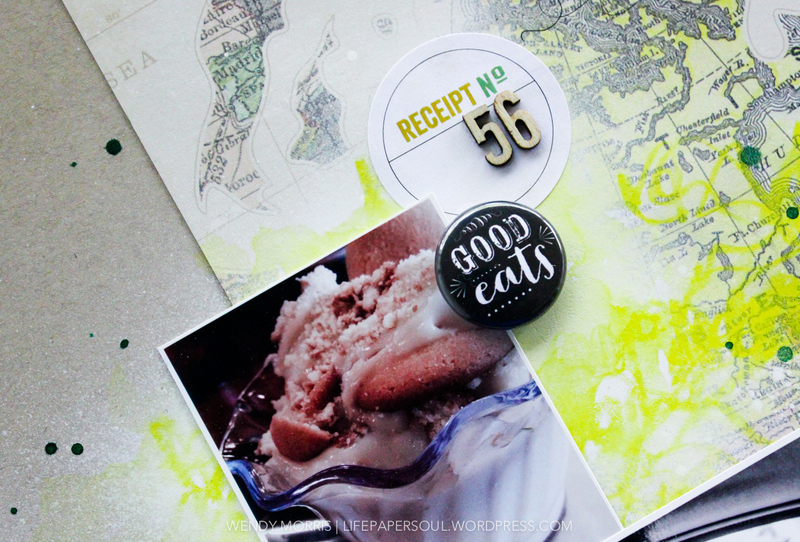 I worked several details into my project using LOTS of Evalicious goodies! So, let's get to it! Also, too many times I'll grab 1-2 photos for a project but I made an exception here to use 5 photos. I used the '&' from Just Us Miscellany V2 as part of my title '14 & Noteworthy'. It was just the perfect pop of dimension for a twist on my title work. I added my own touch of painting and misting on the numbers and cardstock base. 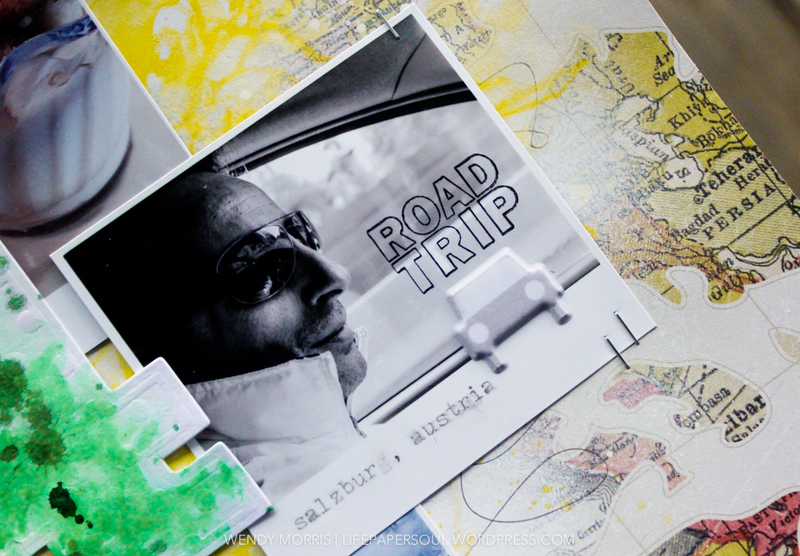 I chose to stamp directly on my photo with the Road Trip stamp set + Staz-On ink. I used the little car sticker from Itinerary V1 Puffy Stickers and my vintage typewriter for the bit of journaling on the photo. What is traveling without a few eats along the way?! I know I like to check out the local eats when traveling. Well, this banana pudding was to dieeee for right in my own state of Alabama and definitely 'good eats'. I used the badge button from Everyday V1 along with a fun sticker from Everyday Miscellany for a bit of expression on that pic. Sometimes I like to take my stamping to the next level. 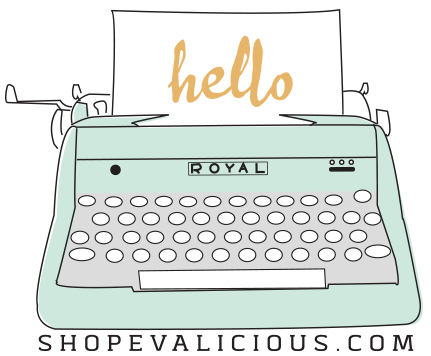 So, I worked the 'hello' stamp from Typewriter Love stamp set. 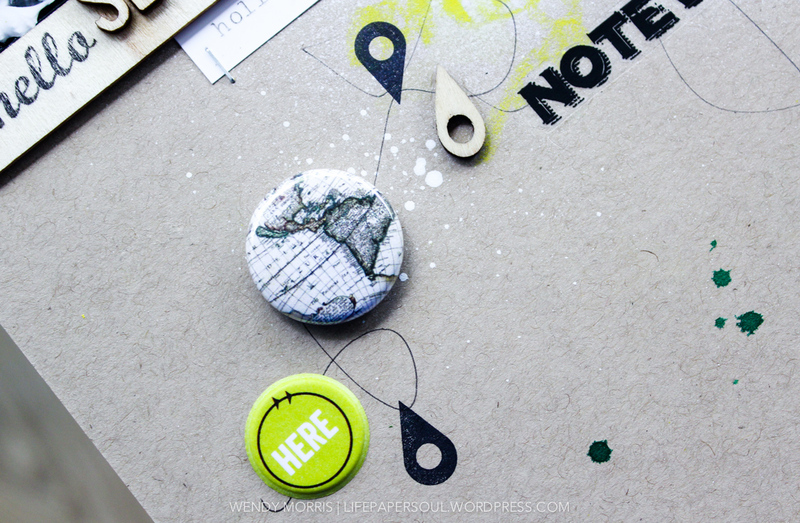 I made a fun twist with the geotag stamp from Love Today along with map badge from Vintage Maps to tie into my pattern paper. Also, a sweet puffy sticker 'here' from Itinerary V1 Puffy Stickers. I love this whimsical twist to my project! 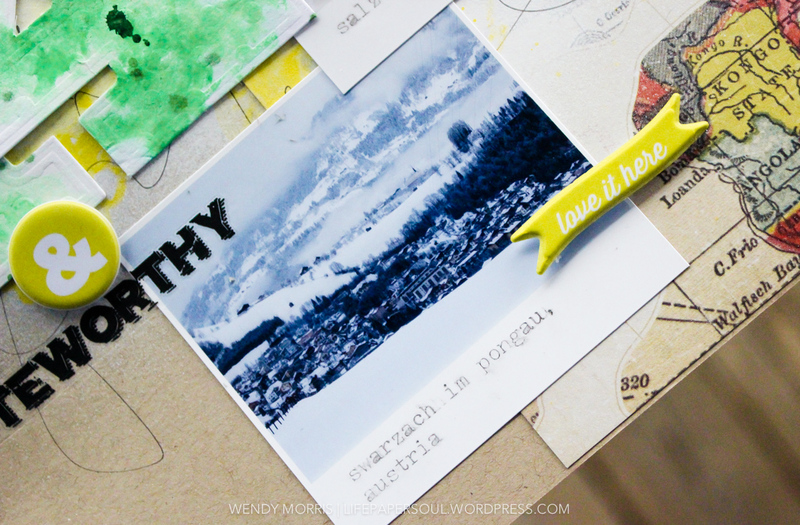 As an ending polish to my project, I added a photo from a Feb '14 visit to my fiancé's city in Austria along and used the 'love it here' from Itinerary V2 Puffy Stickers. The full supply list will be posted up later today on my blog. 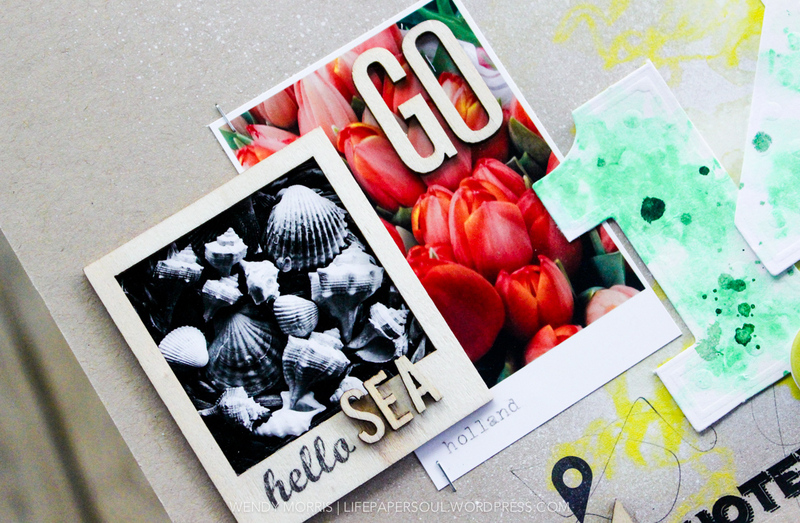 I love seeing all your projects of your travels!I love how you spread the buttons on the page, such a fun look!